ETC Fire understand the vital nature of high quality safety equipment when fighting fires. We provide a comprehensive range of fire extinguishers and are able to help you with the installation and maintenance of your fire extinguishers all around the Sussex area. When it comes to the right fire extinguisher for your situation don't trust to guesswork - when it comes to your personal safety, your staff safety and your premises, investing in the right fire extinguisher and keeping your fire extinguisher maintenance schedule up to date will save lives. Our dedicated team of fire experts at ETC Fire are specialists in all aspects of fire safety and can advise you on which fire extinguisher is appropriate for different areas of your environment. Our fully trained, highly experienced operatives are able to give your team professional training on fire safety. Of course, the general advice is, if a fire starts, to evacuate the building as quickly as possible to prevent danger to life. However, if your staff are confident with fire extinguisher practice, a small fire can be brought under control quite swiftly. Foam extinguishers - for Class A or B fires (flammable liquids i.e. alcohol, wood, soft furnishings, paper) seals the surface to prevent burning material scattering and re-igniting. 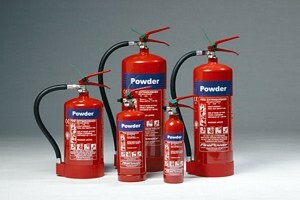 C02 extinguishers - for Class B fires (electrical items, flammable liquids) often used on electrical equipment indoors. Powder extinguishers - for gas Class A B and C fires (flammable liquids, chemical, oils, electrical hazards and engines) are a very good choice where there are multiple risks in the environment. Wet chemical extinguishers - for Class F fires (cooking oil and fat) especially good in kitchens and restaurants for sealing and dampening cooking oil fires. Automatic extinguishers - for wood, paper, textiles, fabrics, as well as flammable liquids and gases these extinguishers offer protection for unattended areas where an immediate response would be needed. With so many different types of fire extinguishers available for different scenarios, people do worry that they might use the wrong one or not have the confidence to handle one in an emergency. However with regular training and if there is somewhere safe to practice, your staff will enjoy a fun and informative training session fitting in some invaluable hands on practice which will improve your company's chances of surviving a fire - and potentially save you a very large amount of money in damages. When it comes to fire extinguisher maintenance Sussex companies can trust ETC Fire for the right service and expert, professional advice. Contact us at ETC Fire for more information or to book a visit.